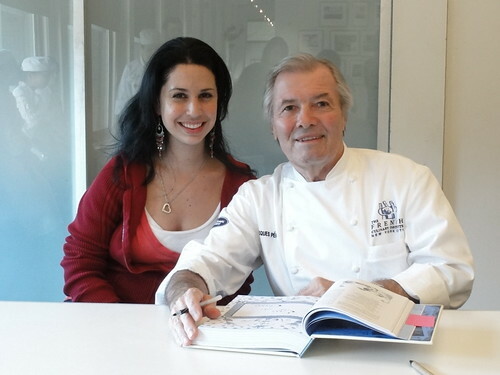 Over the last few weeks I've had the great fortune of meeting some pretty legendary Chefs one right after the other. I've been sooo busy though, that I haven't had time to share all of these amazing experiences here, so I'm going to catch you up on all of them now. First up, the legendary Chef Jacques Pepín. Chef Pepín is one of the original celebrity Chefs and he also happens to be one of the Deans at FCI. 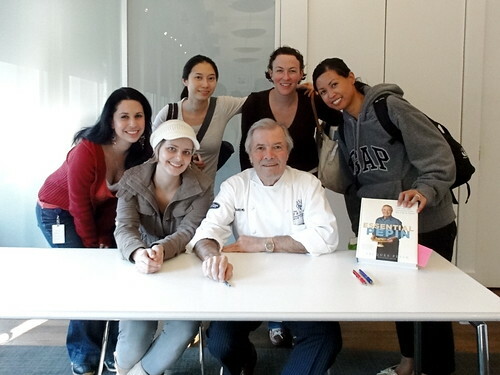 He just released a new book, Essential Pepin: More Than 700 All-Time Favorites from My Life in Food , and had a series of events promoting it at the school, including a couple of demos and book signings for students. I had the chance to go to one of the demos. Watching Chef Pepín work is more like watching a magician perform sleight of hand. He is so lightning fast, so technically proficient, and can do so many things that are just downright cool. I was in awe. I haven't had a chance to watch it yet, but his new book includes a DVD with three hours of content demonstrating his techniques, so you can watch this master at work from home. You can read about on of his recent demos on the Hot Plate. 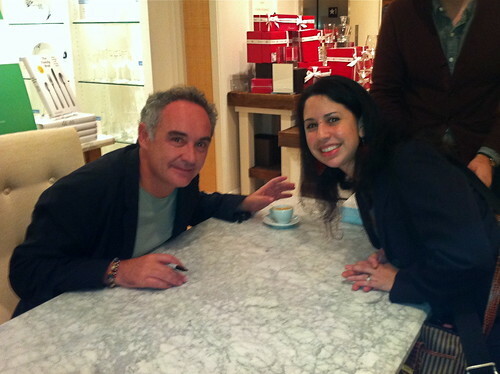 A few weeks ago, Chef Ferran Adrià was in town for a signing of his new book, The Family Meal, at William-Sonoma. It would have been the dream of foodie dreams to dine at El Bulli, but sadly, with its closing at the end of July, that meal will have to remain a dream. So when I found I out that Chef Adrià was coming to town, I knew I had to go. My friend Anna and I arrived an hour and half early and managed to get the second spot in line. Our friend, Leticia joined us soon after and we ran into a couple of acquaintances, so it was a little party in line. Plus, William-Sonoma provided snacks. 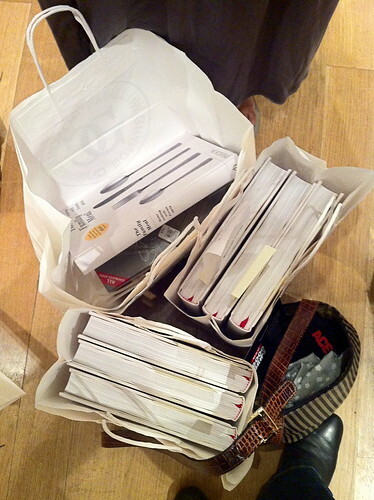 A few classmates couldn’t be there, so we picked up just a couple of extra copies. It was an honor to meet Chef Adrià and I can’t wait to see what his next venture will be. Last weekend I got the opportunity to volunteer at the New Nordic Cookout: A Taste of Denmark at the Union Square Green Market. It was a cool, casual event celebrating the New Nordic Cuisine and it was even attended by Their Royal Highnesses, the Crown Prince and Princess of Denmark. I was super excited about this event because Chef René Redzepi, of Noma, was to be the keynote speaker. I’d already met Ferran Adrià, chef of a former best restaurant in the world, and now I was going to get to meet the chef of the current titleholder. I couldn’t wait! The day arrived and I was assigned to help the wonderful Chefs of Aamanns restaurant in Copenhagen. We volunteers assisted in plating a variety of mini bites for the guests to sample. The chefs were super nice and it was a fun, busy morning. Two minutes later he was up at the podium giving his keynote speech. Mortification! I had not recognized Chef Redzepi from his photo. Suddenly so many things made sense, like for example why Chef Angela from FCI, who was at the event, had been by taking pictures of me and my volunteer partner during this conversation and looking very, very excited for us. Picture Borrowed from this site. In person, he looked more like this. To be fair my volunteer partner had not recognized him either, but she wasn’t dumb enough to ask. Well, now I know that if I were Lois Lane, Clark Kent’s glasses would have probably fooled me too. On another note, Aamann’s will soon opening a n outlet in NYC, so definitely be on the look out for that. Chef Aamann is keeping a blog about the opening here.